Found in the Attic columns regularly seek out forgotten or unusual types of AM receivers, be they farm radios, high-fidelity AM, unlikely frequency coverage, or novelty types. If you're totally stumped by the picture of this device, don't feel too bad. Unless you've had a pilot's license and been flying private aircraft for the past thirty years, you'd have no reason to encounter one of these receivers. This installment follows on the Sony AIR-7, and is our second aviation-related entry. The Edo-Aire R-556 E ADF (Automatic Direction Receiver) is typical of radio navigation aids that were in virtually all private aircraft before the advent of GPS receivers. 2016 marked the 20th anniversary of the release of the Palm Pilot, the first commercially successful PDA, or Personal Digital Assistant. The event passed without much fanfare or recognition. What little there was probably got drowned out by press on the latest iPhone, Google Android or BlackBerry. But the truth is, these devices owe a lot of their conceptual identity to that landmark device that hit the streets in the mid-1990s. This Found in the Attic explores the history of PDAs, the Palm company and the PalmPilots m100 and m515. PDAs are a subset of the larger personal electronics revolution, which began in the 1970s. Heathkit equipment has consistently proven that you don't need to spend a lot of money to get reasonable test gear. 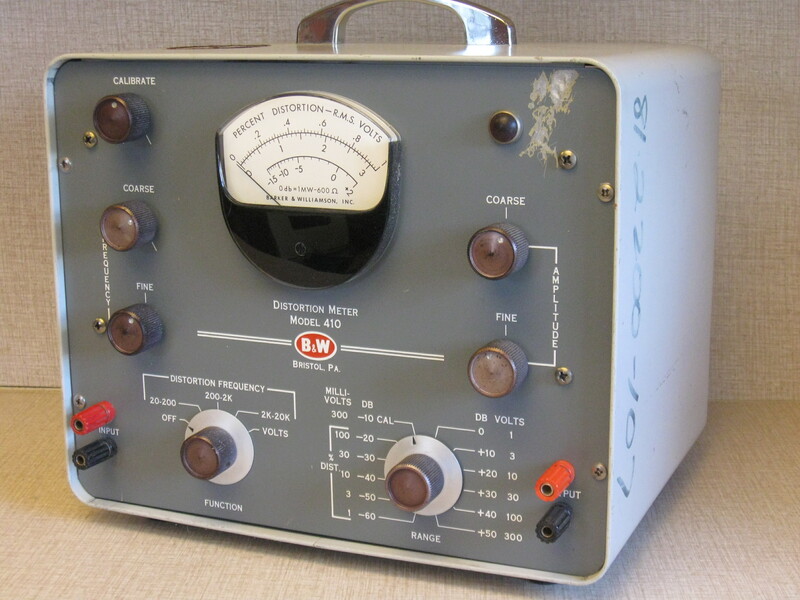 This Found in the Attic feature, the SG-8 RF signal generator, is no exception. It was introduced by Heath in September of 1953, and sold for $19.50. Production continued through May of 1961. Despite the low cost, the stability and accuracy of this RF generator is pretty impressive. The circuitry is simplicity in itself. The RF section consists of a single 12AU7. One triode section is a Colpitts oscillator, while the other is a buffer between the oscillator and output section. Four coils, for bands A-D, are switched via the band switch. The coil for band E, which covers 25-110 Mhz is really a section of bus bar wire. Additionally, useful calibrated harmonics are available up to 220 Mhz. This chapter of Found in the Attic explores a forgotten chapter in the history of broadcast remote control technology, transmitter extension meter panels. In the earliest days of radio, the Commission required all operating transmitter sites to be manned by someone with a First Class FCC license. That person was required to take meter readings every 30 minutes, maintain the transmitter log, and make repairs, or switch to a backup in the event of failures. As technology evolved, and transmitters became more reliable, the rules were relaxed so that sites could be controlled remotely. In FCC lingo, the studio where the operator on duty was stationed was known as the control point. They Commission allowed most stations to have operators with a Third Class license and broadcast endorsement on duty. There were exceptions for directional stations, and those with higher power, which still required the First Class ticket. A recent trip to the attic reminded me of the long-forgotten ritual of an annual proof-of-performance, required of all stations by the FCC. Sitting in a dusty corner was a B&W 410 distortion and voltmeter. Time to bring it down for a general cleanup and photoshoot. The theory of total harmonic distortion measurement is simple. Feed a low-distortion sine wave into the device under test. Connect the output to the distortion analyzer. Filter out the fundamental frequency. What's left is second and higher order harmonics and noise. Of course, when theory is put into practice, things can get complicated. A good AC VTVM is an essential tool for troubleshooting analog audio gear, and was also needed for the annual FCC proof-of-performance measurements back in the day. B&W 410 and HP 403B meters were frequently seen on the bench at many stations, but an equally-impressive but less remembered device was the Navy ME-6D/U. This installment of Found in the Attic recalls this often overlooked AC voltmeter. For over four decades, open reel tape was the medium of choice for radio stations and recording studios. Over that time, recorder technology, in particular the record-playback electronics, made quantum leaps in performance. Vacuum tubes gave way to transistors, and finally integrated circuits. The history of the technology is quite interesting, and this month's subject is a bit of a mystery, so come along as we examine Taber Manufacturing and Engineering Company's Taberamp tape recording electronics. From the late 1950s through the 70s, Ampex 350 and later 440 recorders were a staple at practically every radio station in the country. They were legendary for their battleship-quality construction and long life. Ironically, that was also part of the problem. 350, and later 440 record-playback electronics were alive and well for many years after their audio specs had passed their prime. The lowly turntable preamp was one of those things that got no respect at most stations. It was often left in the dark, hanging by the wires inside the turntable pedestal. Stations that would spend a princely sum on a new console, audio processor and transmitter would simply move the old preamp into the new studio. As the drive for better audio quality ratcheted up, that began to change, but slowly. New York City’s iconic Empire State Building’s prominent place in the history of FM and television transmission might have never come about unless someone’s idea for the top of the building turned out to be one of the wackiest proposals since the Atlantic tunnel between New York and Europe. Military communications receivers have always been coveted by short wave listeners and radio amateurs. With rugged construction and great specifications, what's not to love? When this equipment turns up at surplus electronics retailers, it usually comes at a great price.